Can somehing water resistant ever be stylish? Its fair to say my wardrobe does not feature many items which could be deemed practical. I have always quite prided myself on never owning proper coats (except for fake fur ones) or walking boots and fabrics which are water resistant make me slightly shudder. Which is all well and good until the become the proud owner of a dog. Dog walking in the rain in a cashmere cardigan and ballet pumps is no fun at all. 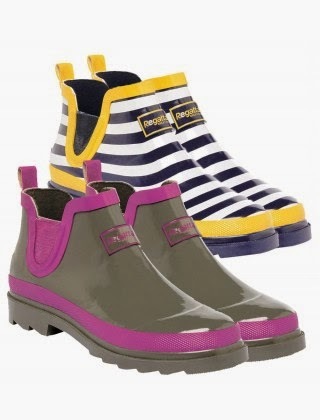 So when Regatta got in touch to congratulate me on getting the divine Mister Truffles and to see if I would like them to send me a coat, wellingtons and rucksack to make my daily walkies more fun I realised it was time I investigated the plus size anorak. When you are of the big boobied persuasion anything anorak like can make you look like a sausage in a skin. I often find coats have to be huge to fit my chest and then are massive around my arms and shoulders. 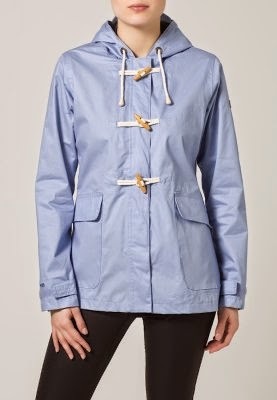 So I wasn't hopeful that the Womans Legacy Jacket £36 they sent would work on my figure.I did love the Padington bear style buttons,hood and the lovely blue colour though so crossed my fingers I might have found something not too drab for muddy walks in the park. As its a jacket its hits the top of the legs so great with leggings or jeans. It does up with a zip but also has very cute buttons which do elevate it slightly from the usual hill walking garb. The jacket arrived just before I went away camping in North wales and I totally put it through its paces, blustery wet walks along the beach,using it as a blanket for impromptu picnics and it still looks immaculate (and yes it kept me very dry) Do I feel like a style mavern in it? No, does it totally serve my needs, absolutely. Regatta also very kindly sent me these Lady Juniper low wellies £25 which if like me you have very chunky calves are a godsend. Not only are they incredibly comfortable but so easy to slip on and off and the stripy ones look a bit like bumble bees which works for me. I have also used the Lady Huntsfield rusksack £40 a lot this summer, especially for chucking in swimming gear when I take baba for a splash at the local pool. Its big enough to fit our towels and costumes and is very comfortable on my back. Its also come in handy on more than one occasion when Mister Truffles has decided he can't be bothered to walk any more! So I have a practical dog walking outfit which doesn't make me feel too frumpy and more importantly will withstand paw prints, sea salt and whatever the British weather throws at me. Regattas range currently goes up to a size 20 and they have a very good sale on at the moment. 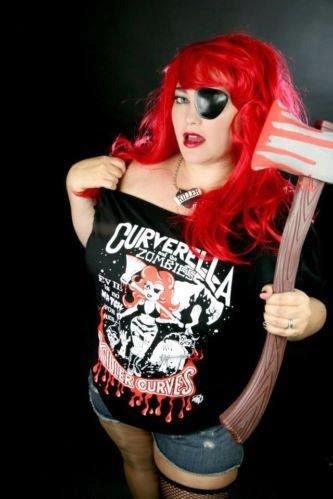 Nicky Rockets is having a great giveaway over on his facebook page Hope on over and a Curverella tee-shirt,lady fit tee or vest could be yours.